Thank you to those of you who have e-mailed me about this series. I'm so glad that it's able to bring some inspiration and encouragement! Welcome to another installment in our 40 Days for Vocations. 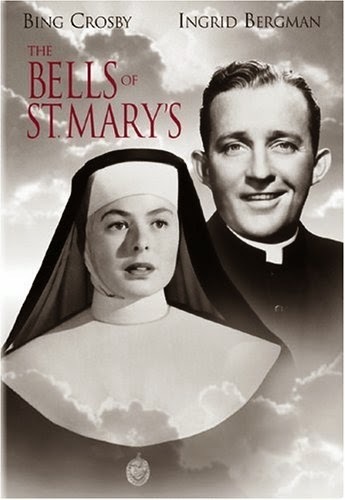 Today I'm sharing with you my favorite movie for vocations. The movie I'm sharing with you today is, hands-down my favorite movie. It even tops The Sound of Music in my book...and I love that movie! What I love about this movie is that it makes priests and religious appear so human, so normal, so accessible, and so lovable. That's been my experience, and it's the experience I want for my daughters, too. Priests and religious are people, too! I love, too, how this movie makes vocations so attractive. Ready? Not only are the two leads amazing actors (especially if you're a fan of Casablanca or White Christmas among others) but they really bring the characters of Fr. O'Malley and Sr. Benedict to life. There characters are funny, nuanced, and imperfect - but so full of life and joy. The basic premise of the movie is that Fr. O'Malley is sent to a failing parish/school to close it down. But, in the process, he is taken in by Sr. Benedict and the sisters to see what a gift St. Mary's is, and plays his own part in their plan to save the parish. 1. Spiritual Fatherhood and Motherhood is beautifully portrayed. If you want to see life-giving celibacy at its best, this movie is a fantastic example. Sister Benedict is truly a mother to so many - to the littlest of the students as they prepare for their Christmas play (I love the incredible affection and amusement she and Fr. O'Malley share when they watch these little ones rehearse), to her in-between students (I love how she mentors Eddie to stand up for himself, but also to show forgiveness), to her older students (she truly wants to understand and mentor and love dear Patty), and especially to her fellow sisters! Fr. O'Malley is truly a father to many. He invests in the lives of Patty and her family, even restoring a marriage in the process. He looks out for the sisters. He gives pats on the backs to the rough housing boys in the school yard, and throws the schedule into chaos at the beginning of the movie (which is such a dad thing to do!). But ultimately, he has the desire to protect and provide for the needs of all those in his parish. In the midst of all of this, though, there is no scandal, no abuse, just trust. I feel like Hollywood has forgotten how to portray priests and religious without scandal. But the reality is that the spiritual motherhood and fatherhood of sisters and priests is powerful. It's just beautiful to see that happening so naturally and beautifully in this movie - and in such a healthy way! 2. Celibate friendship is presented in a believable way. Fr. O'Malley and Sr. Benedict very clearly love each other. But they don't love each other in a romantic way. It certainly isn't because they are unattractive (because they're both gorgeous specimens of humanity). It's because their love is more nuanced and deeper than that. They are brothers and sisters in Christ, working side by side to build up the Church and tend to the needs of their spiritual "children". There is no awkwardness about this, and no hint at inappropriateness or possible romance. They truly love each other in a chaste way. This is integrated and healthy sexuality at its best! 3. Religious Life and Priesthood look attractive and accessible. Fr. O'Malley and Sr. Benedict are relatively young and are completely in love with their vocations. They are happy, they are real, and they're the sort of people you would want to be friends with. Without talking nonstop about their faith, they preach their faith nonstop. They make God's love completely believable by the way in which they love! !